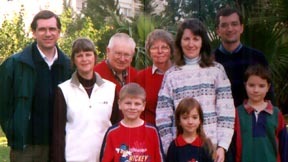 (Above) The main purpose of this 2001 visit was to see Michael's sister and family, who had been working in Turkey for many years. Michael's parents also flew to join us (and footed the bill!). 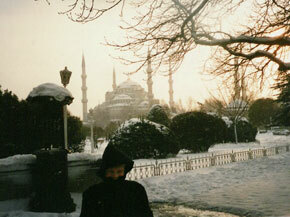 (Left) Andrew freezes in front of a famous church on our unexpected visit to Istanbul (see below). (Left) After flying to visit friends in Israel, we had a one-day snow-bound layover in Istanbul, the only city that straddles two continents. This was our view from a ferry on the Bosporus. We also visited the Aya Sophia (see above), a Byzantine church that was earth’s largest enclosed space for 1000 years! 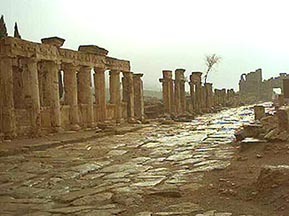 (Right) Michael & Vivian stand in Perga’s Coliseum, once likely used for great chariot races. 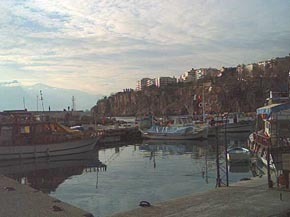 St. Paul landed here at Antalya’s quaint harbor (called Attalia in Acts 14:25). We hope his companions were as gracious as Michael’s sister and her family, who showed us a wonderful time! 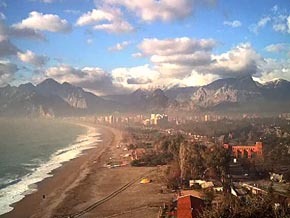 Antalya’s beautiful Mediterranean beaches and snow-capped mountains attract a lot of European tourists annually, and it is easy to see why! The food is also wonderful—so what are YOU waiting for? 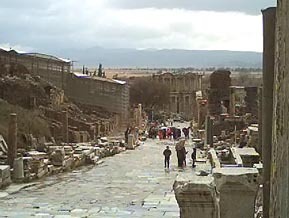 Like Ephesus, the ruins of Hieropolis (here), Perga and other sites gave testimony to Turkey’s great past.  The region claims a 7000-year history under a vastly different host of rulers. The obvious absence of Christianity, once centered here (in part), reminds us that Christianity is not a race or culture that is effortlessly passed down to each generation. Christianity springs from forgiveness via a faith-based relationship with Jesus Christ. Much of the Bible was written to people living in what we now call Turkey. We found our hearts refreshed there as we shared Christmas with family (Michael’s parents were also over from the USA) and visited sites from Biblical times. For more vacation photos click over to our next stop: Israel. You can also click here to read an article about this trip.